The media giants have devised activations around popular TV shows as well as featuring sporting personalities and a glamping experience. Virgin has worked with a number of agencies for its activations, such as Curb, PrettyGreen, Clive and Itch, and also partnered sporting personalities such as Usain Bolt. @VirginMedia has 269,000 followers, more than 340,000 "likes" on Facebook and an Instagram following of just under 10,000. Virgin Media’s "Bolt on the Thames" activation by Curb featured the Olympic gold medallist sprint on a platform on the London river, marking one month before his appearance at the Rio Olympic Games. 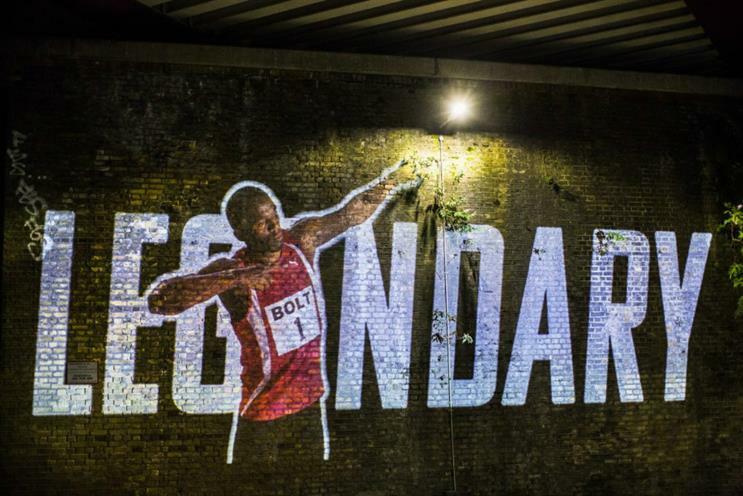 The brand also projected a virtual version of the sports star on to the streets of London to run a race around the city's iconic landmarks to celebrate Bolt's last race in August 2017. Virgin Media also invited kids of all ages to test their jumping skills on a trampoline disguised as a bed to mark the launch of the Virgin TV kids app.The stunt aimed to celebrate what it means to be a child while promoting the app, which is aimed at three- to seven-year-olds. Virgin TV created an interactive red carpet experience to celebrate its sponsorship of the 2018 Bafta TV Awards, with 360-degree cameras offering fans different views of the event that they could access from their phones. It featured the "Last-minute mirror", positioned at the entrance to the red carpet, giving guests an opportunity for one last check before the big walk. The activation opened a window for viewers to enjoy a little playful interaction with their favourite attendees via reactive messages appearing on top of the large vanity mirror. BT has created activations in partnership with shows broadcast on BT TV and also developed other activity in-house. BT’s Twitter account, @bt_uk, has 86,500 followers, its Facebook page has close to 300,000 "likes", while its Instagram feed has just under 3,000 followers. To promote AMC drama The Terror, an installation that appeared to have figures of 19th-century Arctic explorers trapped inside a block of ice was placed in London's Greenwich in April last year. The activation was located outside the Old Royal Naval College and marked almost 175 years since the Franklin expedition set off for the Northwest Passage. Passers-by were able to climb into a chamber in the sculpture to experience the Arctic conditions the crew had to deal with. BT TV also created an office in a phone box in Saul – a small UK village with a population of 700 – to mark the debut of Better Call Saul. The show charted the story of how main character Jimmy McGill transforms into Saul Goodman, the infamous attorney from the show's better-known sibling Breaking Bad. BT created a summer glamping experience at the BT Tower to mark the launch of its converged fibre and 4G plan. The "BT plus great indoors" activation turned the 34th floor of the building into an "oasis above London", where visitors could connect with their family and friends. Guests moved through five zones; they could put their feet up to watch their favourite sports, enjoy an area that recreated a summer picnic in the park, while another area took them through the sights and smells of the beach. BT's activations have created a buzz around new shows. Virgin Media, meanwhile, has managed to create a bigger splash, namely through its partnership with Bolt.